Product prices and availability are accurate as of 2019-04-22 10:52:09 UTC and are subject to change. Any price and availability information displayed on http://www.amazon.com/ at the time of purchase will apply to the purchase of this product. Described as the "quintessential reference" for Alaska travelers, The MILEPOST® offers mile-by-mile descriptions of more than 15,000 miles of road in Alaska, Yukon, Northwest Territories, British Columbia and Alberta. It's 700-plus pages detail accommodations, camping, sightseeing, attractions and services,as well as fascinating facts on the history and wildlife of the North. Trip planning help and answers to frequently asked questions are addressed in the Travel Planning section, with features on crossing the border, traveling with pets, the Alaska ferry system, driving conditions, railroads, tours and wildlife. Suggested itineraries are mapped out to help travelers plan their trips. 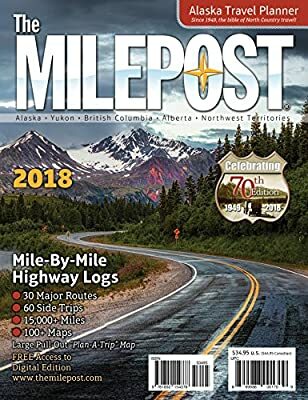 The 2018 edition of The MILEPOST® is the 70th edition of this classic travel guide, which was first published in 1949 as a 72-page guide to the recently opened Alaska ("Alcan") Highway. A history of the Alaska Highway is included in The MILEPOST. The MILEPOST® has more than 100 city and road maps; the wildly popular pull-out Plan-A-Trip Map; more than 600 photos; and free access to a digital edition for print book buyers.